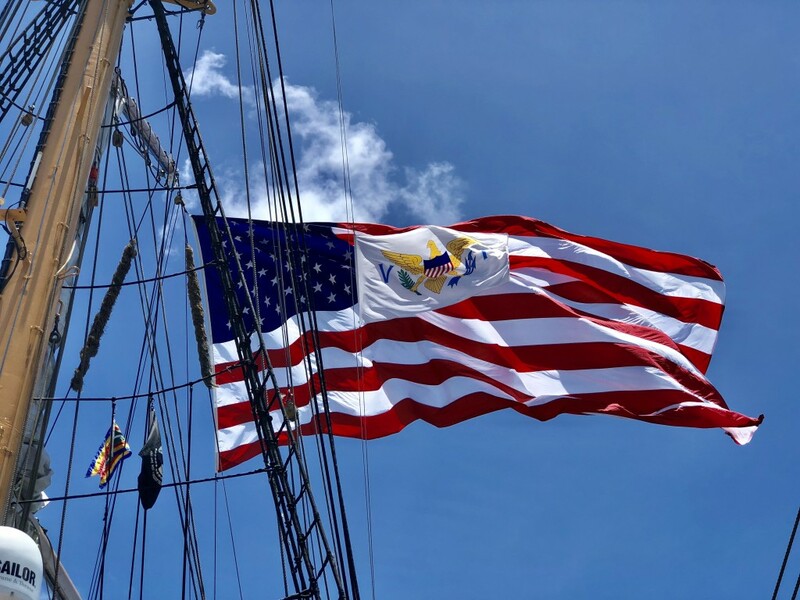 Sailing into St. Thomas on Saturday, we had the unique opportunity to tour one of America’s treasures – The Barque Eagle or America’s Tall Ship. At 295 feet with 380 tons of ballast and a spectacular sail area of 22,227 feet, this USCGC Eagle beauty serves as the United States Coast Guard training cutter for future officers. 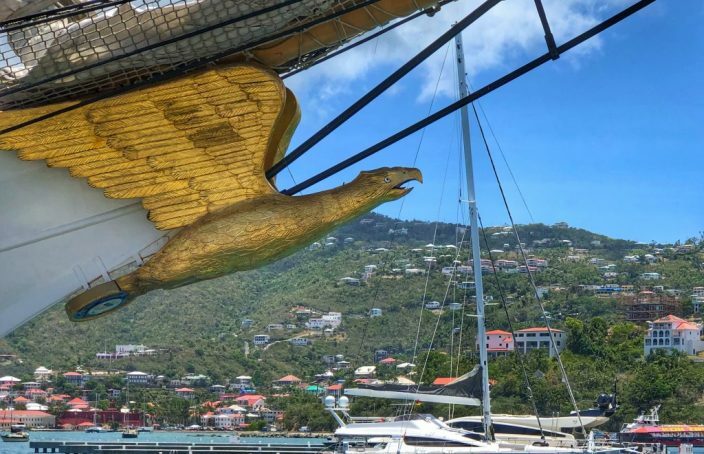 Called the Barque Eagle as a barque is a sailing vessel with 3 or more masts having the fore and mainmasts rigged square and only the mizzen (the aft-most mast) rigged fore and aft. USCGC Eagle is both home and classroom to cadets of the U.S. Coast Guard Academy. While on board, cadets and officer candidates receive a large amount of instruction from the crew. 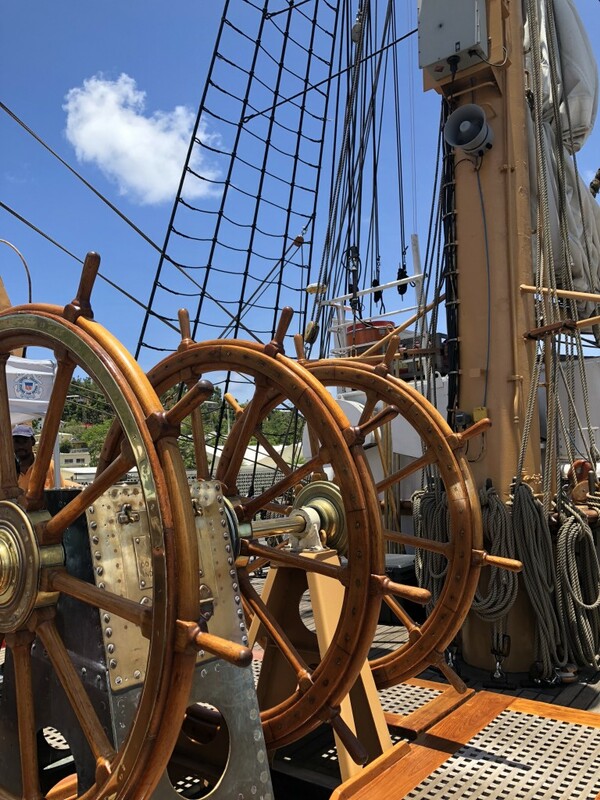 They take classes on numerous subjects that are key to life at sea, including navigation, seamanship, ship and boat maneuvering, line handling, sailing, first aid, weather patterns, damage control, engineering, and advanced career development. 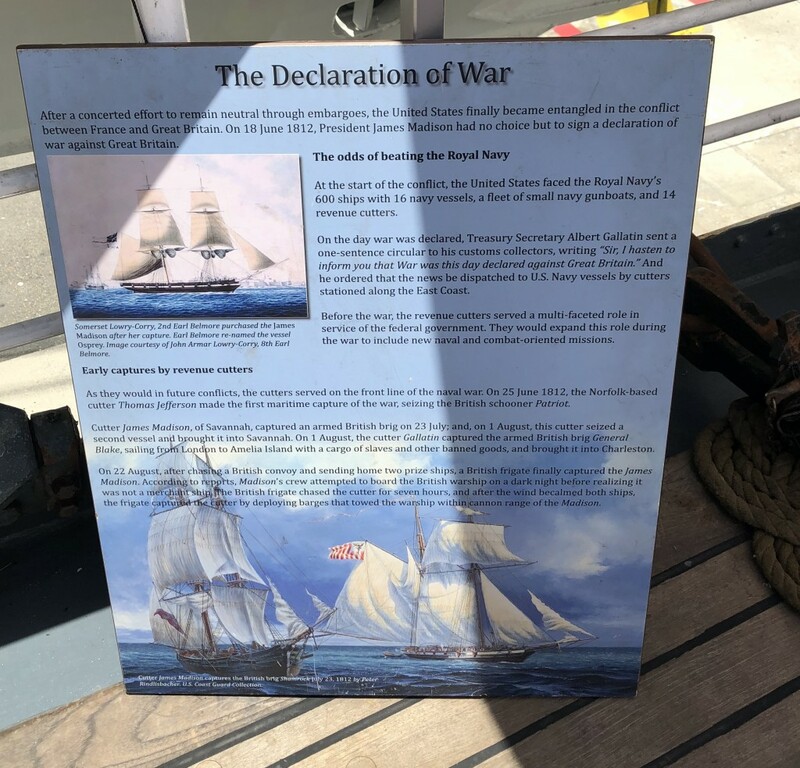 They also stand watches in the engine room, on the bridge, on deck, in the scullery and galley, and during port calls, they assist the public by giving tours. On our tour the cadets provided a wealth of information and their enthusiasm was evident. The USCGC Eagle was originally known as the Segelschulsciff (school sail ship) Horst Wessel. Built in 1936 at the Blohm and Voss shipyard in Germany. SSS Horst Wessel served as the flagship of the German sail-training fleet. After the war, the Allied nations secured the vessel as war reparations. “The Coast Guard, along with the naval and merchant services of many other nations, has continued to employ a sailing school ship to train. 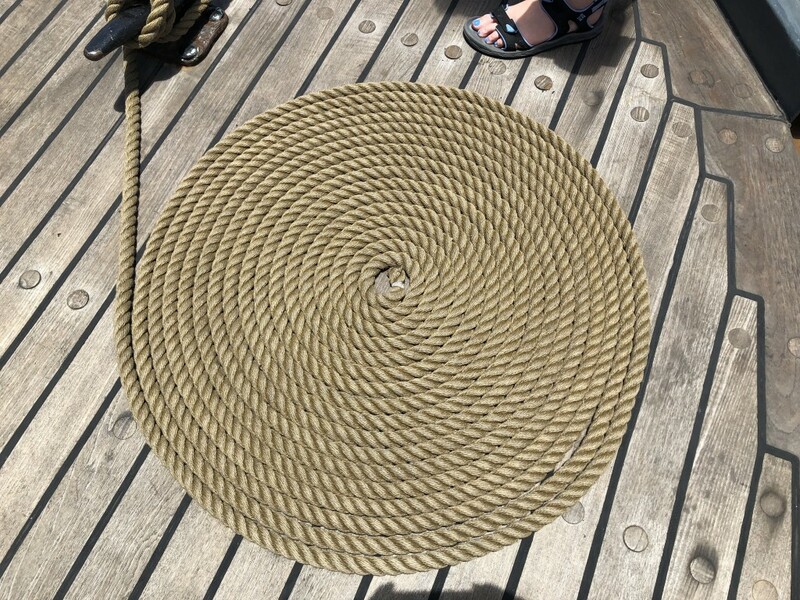 It has long been recognized that even in an age of technological complexity, sail training still provides the best possible foundation for seamanship. The sea has not changed. It remains the same unforgiving environment that it always was, as capable of destroying a modern supertanker as it was of destroying the frail wooden sailing craft of an earlier era. Anyone who aspires to become a seaman must begin with acquiring a firsthand acquaintance with the relentless forces of wind and wave at sea. Only by starting with such an understanding can the sailor learn to recognize and respect both personal limits and those of the ship on which he or she must depend both for survival and the successful accomplishment of assigned missions. To find out the location of the USCGC Eagle for free tours, check out their Facebook page here. 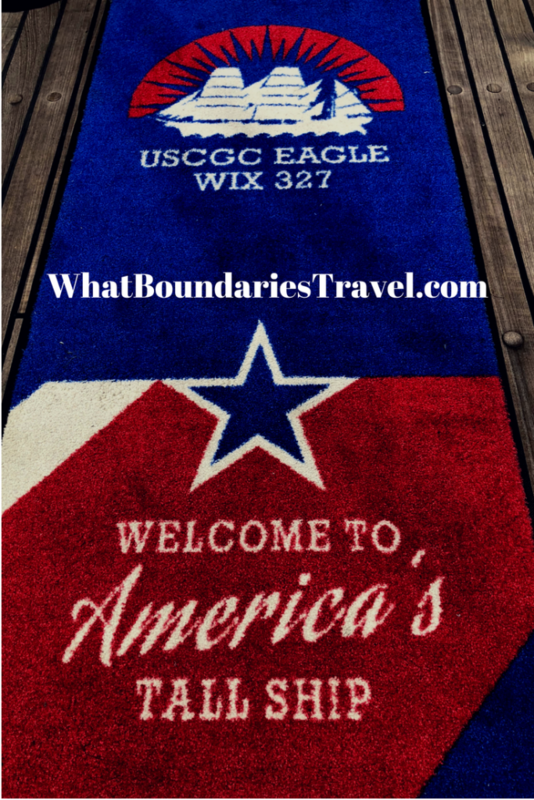 Continue exploring the United States treasures with a visit to the Statue of Liberty and Ellis Island. It’s a beautiful country to live and to visit! Happy travels! 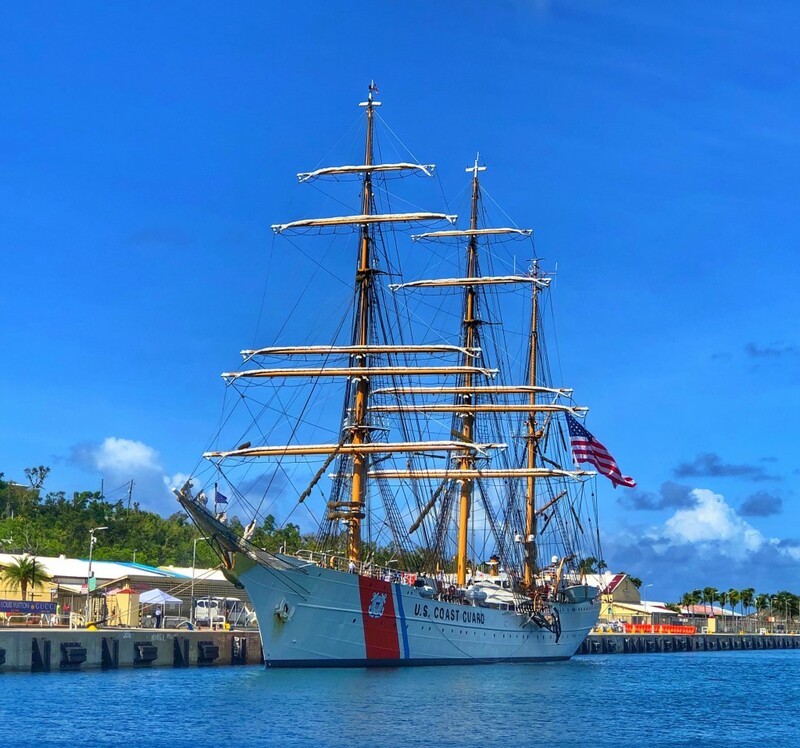 USCGC Eagle is America's Tall Ship and the training vessel for the United States Coast Guard officers and cadets. Learn the fascinating history of this magnificent ship and everything she's capable of doing.